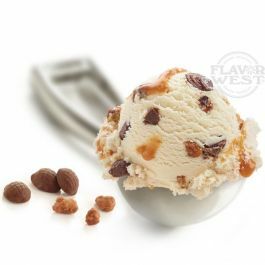 Toffee dream cream is a delicious combination of creamy toffee. This is an excellent flavor that can be add to most of your desserts, ice creams and a lot more. What a better way to relax with this perfect flavor finish. Type: Toffee dream cream Water soluble Flavoring. Usage Rate: 15-20% Ingredients: Natural and/or Artificial Flavoring, Propylene Glycol and Alcohol. Flavor suitability: Baked treats, desserts, cakes, drinks and so much more. Specific Gravity: 1.06 No Refunds on Flavoring. Excellent and very tasty for ejuice! I fell in love with the "Toffee Dream Cream" ejuice at a local Texas Vape shop.... After searching the internet for it I found the flavoring used... and this is it!!! I used it at 20% and it is delicious!!! The vape shop should have changed the name a bit but oh well.... I can make it my self and save about $15.00 a bottle now. Woot!